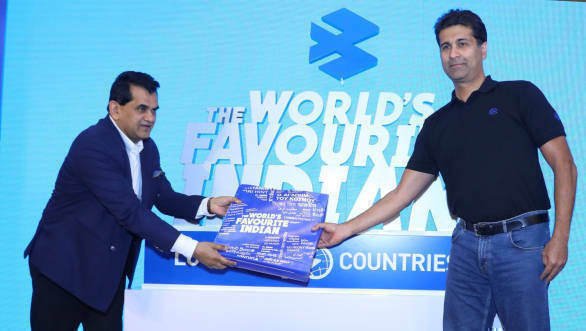 Pune based Bajaj Auto, in an event organised in Delhi today, announced its global brand identity, "The World's Favourite Indian". The popular motorcycle manufacturer states that the new identity announced the dramatic transition from a domestic scooter maker to a global motorcycle powerhouse in a period of seventeen years. Bajaj Auto has begun to be an important international player considering 40 per cent of the contribution to revenue comes from sales to over 70 countries. Bajaj Auto mentions that the exports has earned USD13bn of forex in the last 10years. This helped Bajaj Auto achieve a milestone of 2mn units of international sales in 2018. Amitabh Kant, CEO NITI Aayog and Rajiv Bajaj MD, Bajaj Auto. "Our international performance is validation of our strategy of focus and differentiation. Our unwavering commitment towards building the best motorcycles in the world through design, technology, quality and customer satisfaction have made us a truly global brand. Bajaj brand is not only The World's Favourite Indian, but also perhaps the most illustrious ambassador for Make in India initiative of the Indian government." commented, Rajiv Bajaj, Managing Director. He further added, "In only 17 years since the launch of Pulsar, we have become the third-largest motorcycle manufacturer in the world, ahead of several Japanese and European brands that have been around for much longer. In any market around the world, when people think of motorcycles, they should think of Bajaj. That would help us achieve our vision of being a Global Motorcycle Specialist." The new brand identity would be communicated through a marketing campaign featuring TV, outdoor, print and digital media. The retail showrooms of Bajaj Auto motorcycles and commercial vehicles will also undergo a transformation with new signage and branding in line with the message of The World's Favourite Indian.